A real cook can never have enough gadgets in the kitchen. Since my teenage days, I always pestered my Mum to buy a mixer and a fridge-freezer for us. Once I got married I would be on the lookout for something new for my own kitchen. Every visit to the shopping centre or even when on holiday, my eyes are on the prowl for culinary gadgets, whether big or small. I always feel so safe when I have these gadgets sat on my kitchen worktop, I know I can cook anything without worrying about time constraints. For me to cook a perfect and delicious meal, my secret weapon is a blender or a mixer, a gadget that can make smoothies, milkshakes, sauces, chutneys, nut butter, batters and so much more. So I did my secret happy dance when a premier blender company Froothie contacted me to try their latest high speed blender and become an Ambassador. How on earth could I decline?! I took barely seconds to make a decision. The Optimum VAC2 Air Vacuum Blender is one of the latest blenders from Froothie's High-Speed Blenders range. When I first unpackaged the blender, it looked really business-like and imposing but a quick read of the manual alleviated all of my fears. It is, in fact, very user-friendly and foolproof! I love the gloss black base and the BPA-free 2L capacity jug is a bonus. I also love the touch display. It gives a very expensive feel to the machine. There isn't much assembly involved with the blender as the blade is attached to the jug. The jug has a square base so sits easily on the motor. 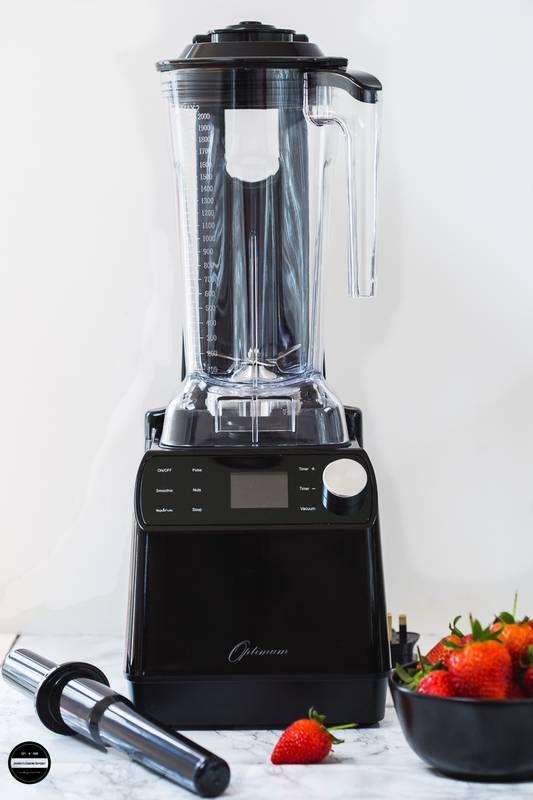 The blender is unique in that it has a pre-blending oxygen vacuuming function minimising oxidation and destruction of nutrients. Juices and smoothies made hours in advance will still retain their original colour, texture and taste with little nutrient loss - great for juicing on the go! 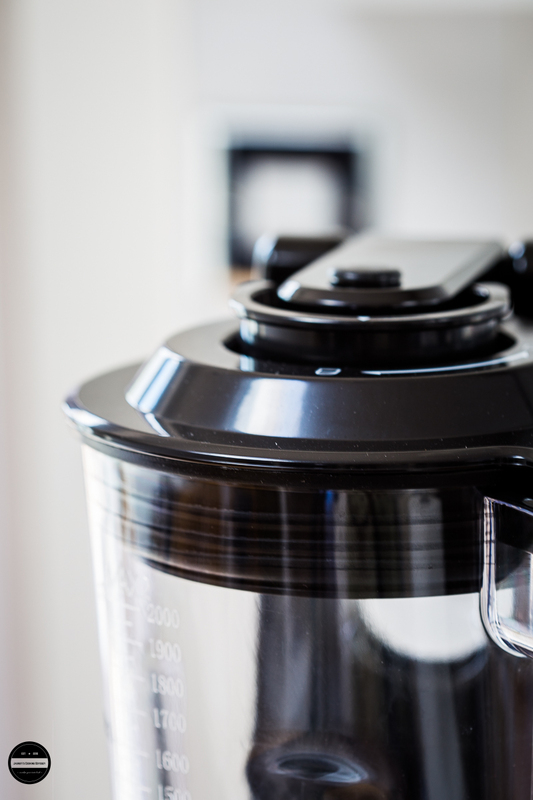 It can still be used as a normal high-speed blender too for all other culinary purposes. The blender can be used as either a Pre-set or Custom function. There are 4 different pre-sets on the machine for quick blends - Smoothie, Nuts, Veg&Fruits and Soup. A quick read of the handy instructions manual tells you all that you need to know about each function and how it works. One that stood out to me was the soup function... I had to read that twice. Soup? In a blender? I am so excited to make soups with my Vac 2 later in the year as we are well into our summer and this time we are almost having an Indian summer! Soups can wait till autumn and winter, so look out for many soup recipes on this blog. The custom function is good for traditional blending, allowing the user to set the duration and speed of the process. 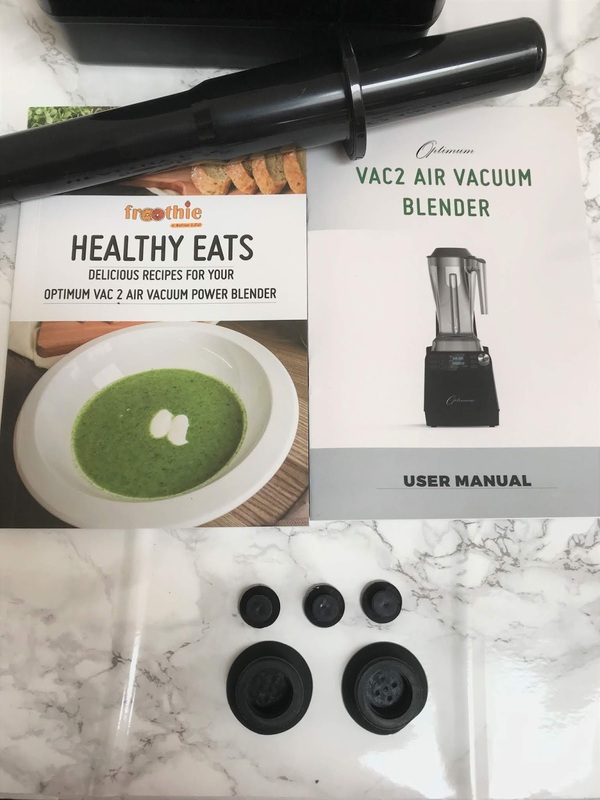 You may ask why the Vacuum blender function is an important addition. 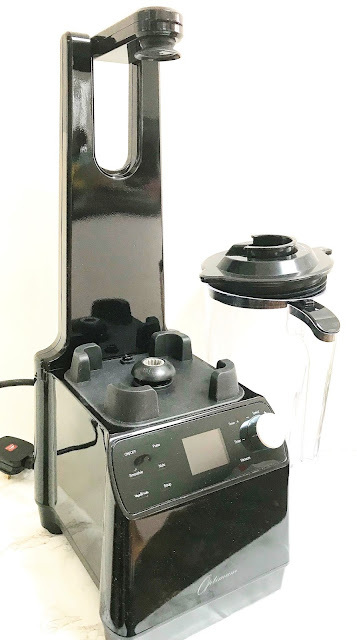 Well, a quick read from the manufacturer's website told me that vacuum blending eliminates the oxidation process by drawing out air from the jug, eliminating the destruction of vitamins and nutrients from the food. So many times I have made green juices and smoothies and ushered my family into the kitchen to drink up immediately. With this vacuum function, I can be rest assured that even keeping the smoothie or juice out for some time will not destroy the nutrients. Speaking of smoothies and soups is all fair and well, but the majority of food preparation in my household is for Indian meals. I have made my way through many blenders in the past that cannot handle vigorous everyday use. 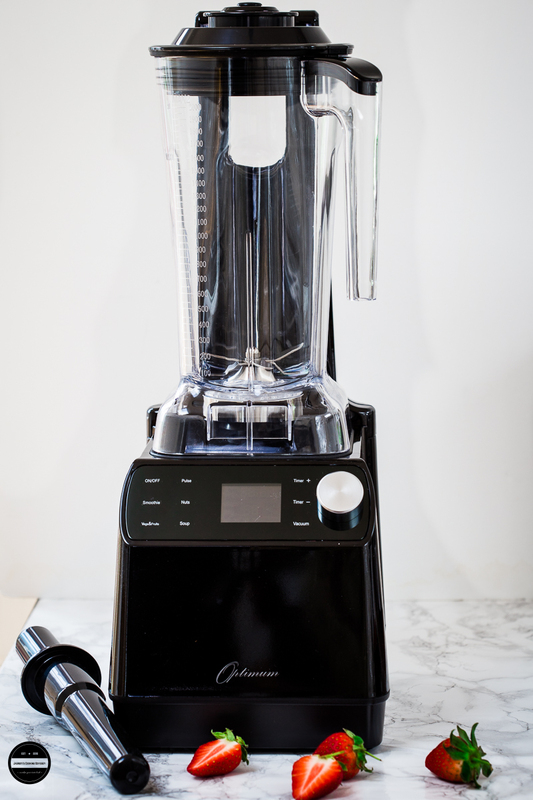 I always like to prepare my meals from scratch for my family, so gadgets like blender are heavily used in my kitchen. I knew I was onto something then when I began using my Froothie blender for my Indian cooking. I feel like this machine rose to the challenge. Many Indian dishes such as curry sauce, chutneys, Gujarati Dhokla,(Steamed Rice and Lentils Cake) Handvo (Spicy Baked Rice and Lentils Cake ) and South Indian Dosa and Idly batter are made by grinding soaked rice and lentils into a paste. In order to get the perfect dish every time, the batter/paste needs to be perfectly smooth and grain free. I could see the immediate difference when using my Froothie blender. The paste was silky smooth and took half the time to reach that consistency and texture. I couldn't be happier! My new Optimum blender stands proudly on my kitchen surface as my culinary companion. I look forward to using it further for my cooking adventures. Five years warranty means a total peace of mind. 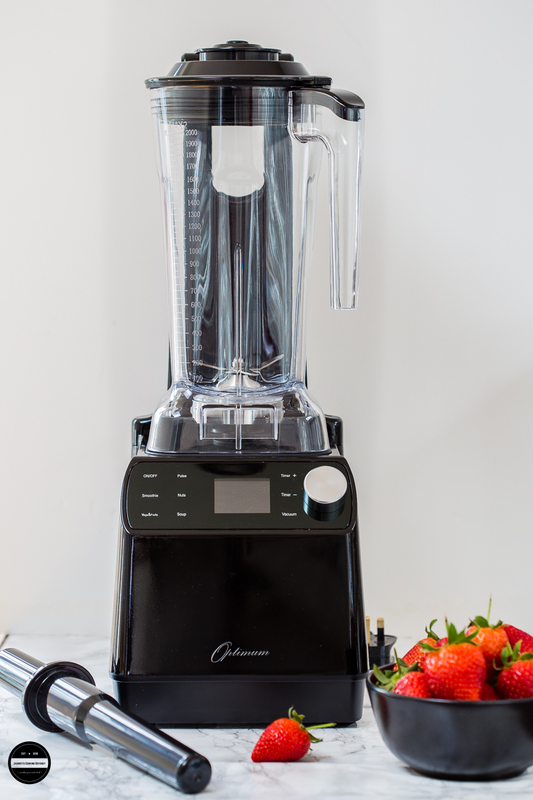 The blender is also available in red and silver and is currently selling at £399 from the Froothie website. Froothie offers a great support 24/7 via free phone numbers and they do offer 0% finance offer on purchases over £299. In addition, Froothie offers 30-day money back guarantee too, if you're not satisfied (but I guarantee you will be)! Simply return the product in its original packaging without paying shipping charge and Froothie will refund the total cost. Disclaimer: Thank you Froothie for sending me your Optimum Vac 2. I was sent this product for an unbiased review not paid or told to write a positive review. All opinions are my own. This post contains affiliate links, if you buy through this affiliate link, you will not incur any additional costs, other than the price of the product. It look like a very cool appliance for kitchen. And moreover the pictures of the blender in addition to the strawberries is way too good.. This looks like such a great blender! I love the stylish design of it, it would look great in any kitchen. I love the name Froothie too, cool! That looks like the mecca of all blenders. Was it easy to clean after use? The one I have currently isn't easy to clean at all! I love making smoothies, and I definitely need a better blender to do so! This looks like a fabulous one for sure.